When you hear of a media outlet peddling debunked and misleading research in order to argue against providing transgender people with important medical care, you probably don't think of The New York Times. But that's exactly what happened in the August 23 Sunday edition of the paper. In an op-ed titled, "How Changeable Is Gender?" Richard Friedman, a Times contributing opinion writer and professor of clinical psychiatry at Weill Cornell Medical College, grossly misrepresented empirical research in order to raise doubts about gender-affirming medical treatment for transgender people, including transgender youth. The post was quickly debunked by Think Progress' Zack Ford and Vox's German Lopez, who criticized -- among other things -- Friedman's conflation of gender identity and gender expression, his misreading of empirical data, and his dismissal of evidence showing the benefits of gender-affirming treatment. The errors in Friedman's research aren't minor -- his op-ed is based on a series of blatant oversights that undermine his conclusions. But as of Wednesday morning, The New York Times has failed to issue a correction or clarification to the op-ed. As Lopez noted, the New York Times' decision to publish "error-ridden articles like Friedman's" will likely make it harder for trans people to find supportive home and medical environments. The Times declined to comment on criticism of Friedman's op-ed. Unfortunately, this isn't an isolated incident for the Times, which has come under increased scrutiny in recent months for its willingness to publish misleading and harmful commentary about the transgender community. In July, the Times published an op-ed titled "What Makes A Woman?" in response to Caitlyn Jenner's Vanity Fair cover photo. The piece, written by journalist Elinor Burkett, was a trainwreck of harmful and offensive stereotypes about transgender women and essentially suggested that trans women haven't earned the right to be seen as 'real' women. The op-ed, which also framed trans equality as a threat to feminist politics, was condemned for peddling offensive and outdated tropes about transgender women. Despite the criticism, the Times rejected a rebuttal column by Meredith Talusan, a transgender writer and advocate. Talusan self-published her response, writing, "I find the way The Times keeps centering white cisgender women's perspectives on Jenner deeply disturbing." 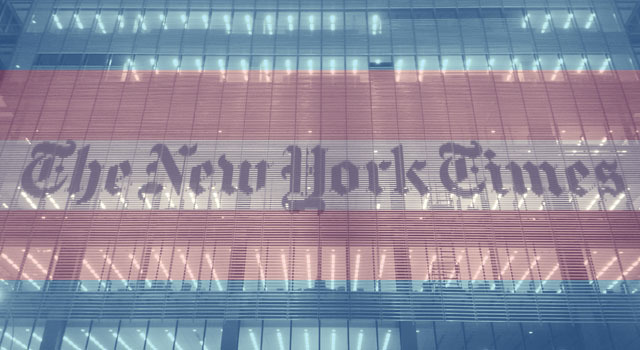 "[A]rguing for my existence feels par for the course this week as The New York Times has already sparked a situation where I and other trans women have been constantly put in the position of having to debate our humanity," she added. And then there's the Times' bizarre defense of research suggesting that some transgender women are actually just men who are sexually aroused by the idea of being a woman, sometimes referred to as "autogynephilia." In April, the Times published a glowing review of Galileo's Middle Finger, a book written by bioethicist Alice Dreger. Dreger is notorious for defending the widely disputed and controversial research of psychologist J. Michael Bailey, who helped popularize the idea that many trans women are actually men acting out sexual fetishes. But rather than lay out the criticisms of "autogynephilia" research, the Times' David Dobbs lauded Bailey and Dreger's work, describing them as truth-tellers facing down "enraged" transgender activists. This notion enraged advocates who insisted that transsexuality came invariably from an unavoidable mind-body mismatch -- a mistake of nature -- and never from a variation in taste, which some might consider an indulgence. These advocates sought not only to refute Bailey but to ruin him. When Dreger defended him, they targeted her too. In the end, as Dreger tells it, she and Bailey won a rough victory. When ­Dreger's book-length paper on the issue was written up warmly in The Times, formerly gun-shy allies were encouraged to speak out. The Dreger fiasco reveals why the Times' missteps in transgender coverage are so potentially devastating: when the paper publishes something about the transgender community, people pay attention. That's because, unlike the fringe right-wing media outlets that publish transphobic pseudoscience on a regular basis, the Times has a reputation for positive and affirming coverage of the transgender community. The paper has worked to avoid misgendering transgender news subjects, elevated the issue of violence against transgender women, published thoughtful editorials about the fight for transgender equality, and given transgender people an opportunity to tell and share their own stories. This week, a reader viewing Burkett's "What Makes A Woman?" on the paper's website likely saw an ad for a TimesTalk event featuring transgender actress Laverne Cox at the top of the page. It's that juxtaposition -- positive transgender coverage alongside damaging and misleading commentary -- that troubles advocates for the transgender community. When The New York Times publishes content that suggests trans children shouldn't be affirmed, trans women aren't 'real' women, or trans people are secretly sexual fetishists, it has more of an impact than any extreme right-wing media outlet could hope to have. It lends the paper's tremendous credibility to discredited and problematic myths about trans people. Harmful content makes up a fraction of the Times' total transgender coverage, but it's that rarity that makes the misinformation so pernicious. And, in the case of Friedman's most recent op-ed, it could end up doing real damage to the most vulnerable members of the transgender community. Image at top via Flickr user Alec Perkins using a Creative Commons License.